When my hunting buddy Dar met me for lunch at our rendezvous point, he said he doubted we could make a small cookfire on the wet, snow-covered ground. After a hot meal of canned pork-and-beans and instant coffee, our innards were rewarmed, and he was very interested in the tinder I'd pulled from my daypack. Shown here burning atop hardpack snow, fire wicks might be the best fire-starting tinder available—but you have to make them yourself. In a wilderness environment, no ability is more likely to save your life than fire-making, regardless of latitude or season. Air temperatures below 98.6° F steal body heat, especially with the added cooling effects of wind and rain; smoke repels insects, and can be seen from a long distance; flames are a fearsome thing to most animals; and the ability to cook wild flesh (never eat raw fish) insures that any parasites are dead. In one respect or another, fire is vital to human survival, and when not being able to make one might equal dying, every trick in the proverbial book is fair. The fire starter my friend had been impressed by employed the simplest technology to create a cheap, waterproof, easily-lighted tinder that has been part of every survival kit I've owned for the past two decades. In my youth I'd employed the classic woodsman's trick of using a candle to ignite damp tinder materials, but while the technique worked as well for me as it had for Kit Carson, it became evident that an entire candle was overkill. All that was really needed to get even wet tinder flaming was a candle wick saturated with enough paraffin to make it burn hotly for the minute or two needed to create a self-sustaining fire. The most basic type of "fire wick" consists of nothing more than thick cotton laundry or packaging string that has been saturated with molten paraffin, allowed to cool and harden, then cut to the desired lengths. The string used must be cotton, never nylon or any other type of synthetic, because these not only don't burn well, but emit noxious fumes while burning. Cotton string is usually found in the housewares aisle, priced at about two dollars for one hundred yards. In the simplest process, a ten-foot length of cotton string is lowered carefully into an old saucepan containing a pound of paraffin (canning wax) that has been heated to a liquid by a camp stove or hotplate. Paraffin is sold in supermarkets for about one dollar per pound. Or you can melt down the stubs from used candles, which works just as well for making fire wicks, but imparts to them whatever scents or dyes were in the candle wax. 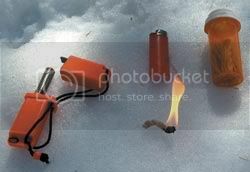 The Strike Force flint-and-steel, a butane lighter, and fire wicks kept together in a container; throw in a little fire-making know-how, and this pocket-size kit virtually guarantees fire in any weather. Always take sensible precautions when melting paraffin; do the job in a well-ventilated place where there is little risk of fire and plenty of fresh air. Wear heavy gloves (not latex or rubber) when handling molten wax, and never allow the paraffin to get hot enough to smoke, because this is a warning that it is about to catch fire. If the melting pot does burst into flames, don't panic; the flaming wax is still safely contained. Simply cover the pot with a loose-fitting lid, which will smother the fire, and turn off the heat. Even with the heat off, the wax will remain liquid for a half hour or so. The next step is to pluck one end of the string from the melting pot using pliers (wear your gloves, too)—always do this in a place where you won't mind a few wax drippings. Pull the string outward in a straight line, allowing it to drag over the rim of the pot, until the entire length has been extracted. Hang the wax-soaked string over a convenient nail or rail until it cools and hardens—usually about 15 minutes. The cooled strings will be stiff enough to lay across a cutting board and cut into sections using a sharp knife, or with sharp scissors. I package the completed fire wicks into "tinder bottles" adapted from pill bottles, 35mm film canisters, or just zip-lock bags, and scatter the hundreds I generally make at a time throughout my gear. My backpack and survival knife sheaths carry fire wicks, but you'll also find them in my kayak, my vehicle's glove box, and next to my wood-fired smoker grill. I even carry them in the toolbox, where they've come in handy for re-lighting gas furnaces and other pilot lights. In most instances, a single-strand fire wick is all that's needed, but sometimes I prefer a thicker, longer-burning tinder. To accomplish this, I use a twist-lock doubling technique that has been used to make rope from plant fibers since primitive humans discovered that skill. Just twist the string in a single direction until tension causes it to coil around itself when pull from either end is relaxed. Hold the twisted string taut while folding it in half to bring the two ends together. Slowly ease tension on the doubled string, allowing it to wrap evenly around itself like a small rope. This doubled (or quadrupled if you repeat the twisting process again) cord can then be dipped into molten paraffin, cooled, and sectioned to make thicker fire wicks that burn twice as long. 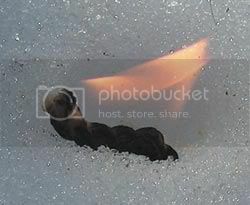 Demonstrating how well fire wicks work, this one continues to flame hotly while melting a hole into hardpack snow. A good alternative to cotton string is wool felt weatherstripping, or old felt pac-boot liners cut into sections. 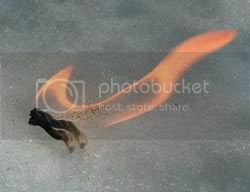 Fire wicks made from felt produce longer-burning fire because they absorb more paraffin, and ignite nearly as well as those made from cotton string. Again, use only felt made from pure wool, because some is comprised of synthetic fibers that not only don't burn well, but emit soot and toxic gases. To use a fire wick, you'll need an initial source of combustion. A butane or liquid-fuel lighter is recommended survival gear at all times, but I've had little trouble igniting a well-frayed fire wick using only sparks from the Strike Force flint-and-steel in my knife sheath. The trick is to fray one end of the fire wick into a small airy mass that flames at the touch of a lighted match. Lay the lighted fire wick onto a small platform of sticks to keep it from being hampered by evaporating ground moisture, add more fire wicks as needed, and slowly build a tepee of pencil-thick dead twigs around its perimeter. Add larger sticks as the fledgling fire grows, until you've achieved a crackling blaze. Considering the value this simple yet very effective fire starter has had for me through many years of survival classes in pouring rains and heavy snowstorms, when not having fire is simply not an option, I'm surprised that no company is manufacturing fire wicks. Until someone does, I'll keep making and using my own because the fire wick has earned a place as a must-have item in my own never-fail fire making kit.